If you’ve ever wanted to enjoy today’s top styles without the need for a wallet-draining price tag or time-consuming maintenance, Cunningham's Flooring America of Ardmore has the right material for you. Elevate any remodel or renovation with one of the most expansive selections of luxury vinyl flooring in Ardmore, OK. At our store, you’ll find everything you need to upgrade your space and project your personal style. First and foremost, you want to live in a home that looks the way you want. Our surfaces offer superior versatility, allowing you to tailor the final room to your tastes. With our luxury vinyl tile and plank flooring, you can even get the look of genuine wood or stone! Enjoy all of the class with fewer dollars and hours devoted to upkeep. It isn’t enough for your floors to look amazing. You want them to feel just as good every time you take a step. 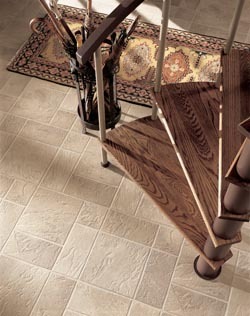 Vinyl is softer underfoot than many hard flooring options. It also delivers gentler sound qualities and additional temperature control, which can help you save on your energy costs versus another flooring type. The best-looking, most comfortable surfaces won’t stay that way if they can’t hold up to the demands you place on them. As a highly resilient flooring material, vinyl can take on the challenges of frequent traffic and homes that host children or pets. With our products, you can get the style you desire -- and keep it for years to come. On its own, this luxurious material offers a near-perfect balance of simplicity and aesthetics. Combined with the insight and assistance of our highly trained team of flooring experts, vinyl becomes an almost unbeatable option for homeowners in any situation. From comparing brands to advising you on luxury vinyl tile installation, we’re here to keep you informed and empowered through the entire shopping process. See why so many customers choose us to provide them with the best in superior surfaces by stopping by our store. Contact us now to discuss your flooring needs with our experienced staff. We proudly serve Ardmore, Lone Grove, Dickson, Wilson, and Healdton, Oklahoma.